In between working on my spirals , I’m working on a commission. Here’s the top, pre-quilting. Commissions are always an interesting process, a mix of my decisions and the clients. This one is destined for a beach-y room – so there are sand dollars, scallop shells and sandpipers – in blue and yellow. There’s something strange about discovering something that you yourself have been doing – like the fact that I never realized I line up my HST blocks on the opposite side of my presser foot from every other seam I sew. Anyone else ever have these moments? Or is it just me? I have a stack of other projects demanding my attention, but I’m busily sewing spiral blocks instead. I’ve got a good stack now, and even though the (full size) quilt will be far bigger than my design wall, I’ve stuck some of the the blocks up there, pretty much just so that I can admire them. I just love this quilt. I don’t usually go through quite this much “process” before I start sewing, but since I did, I thought I’d share the thrill of victory and the agony of defeat… or something less melodramatic. And I looked at it, and I loved it, and I wanted it, and I started imagining it on my bed. I even have a stack of fabric that’s been sitting, waiting for just the right project. Love! And then I looked at it again, and cursed. Quilters, notice how nicely my curlicue’s fit together in a lovely organic, non-linear arrangement then, notice how my beloved design contains about a million and two inset seams, and no clear way to assemble the blocks. Drat! Not sew in a neat grid, mind you, but I did figure out a way to split it into manageable sections with reasonable seams. (the blue boxes) Victory! I’ll show you more once I have some actual blocks to share: I can’t wait to see them myself. I don’t buy charm packs – or layercakes, jelly rolls, fat quarter bundles or whatever precut configuration they’ve come up with now. I know I’m the odd ball on this, but I like to put my money just into the fabrics that I really like from a line. But, I made an exception for Dream On and bought charm packs. They’ve been sitting on my shelf, cheery and bright, waiting. 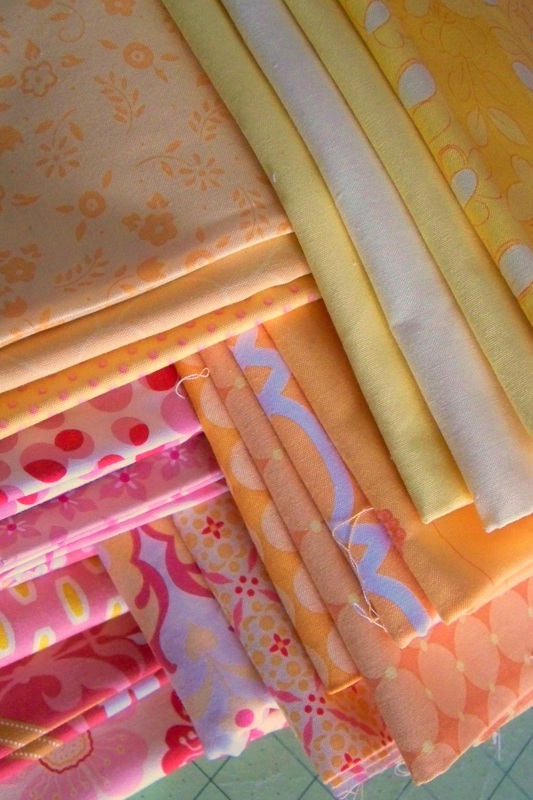 I’ve decided to use them to make a quilt for myself – something fun and bright. But, now I need to decide what to do with them. 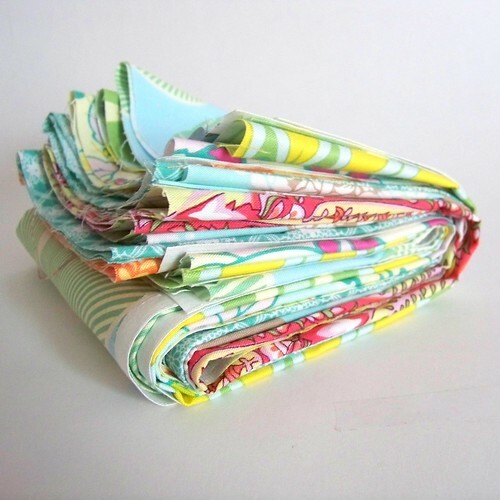 I want something simple, and easy: this is not the fabric for fussy, fidgetty piecing. I think HST’s are about as complicated as I’m interested in. But, I’m open to more: do you have a favorite charm-friendly pattern? I started this mini quilt over the summer (apparently without a blog post)… finished the top in August… mentioned it again in September… and that was as far as I got. Armed with an (early) New Year’s resolution to sew more for myself and less out of obligation, I got back to it and finished it this week. I’m not sure why I waited so long: I love this little quilt. 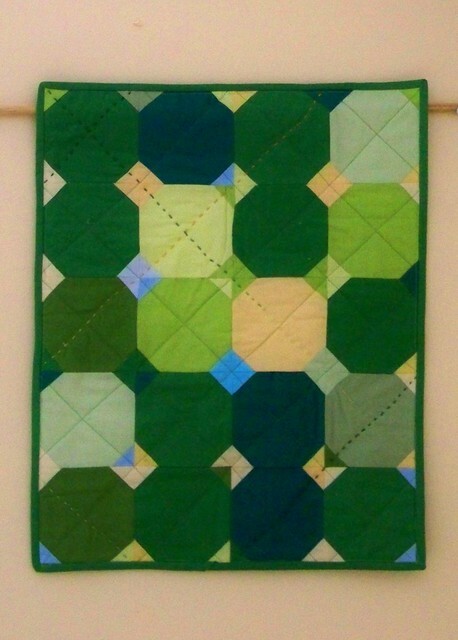 It’s based on City Fair, for City Quilts by Cherry House, and the sun on the birch leaves outside my old office window. (I’ve moved offices since, but that’s another post for another time). By my count, it’s has ten different Kona solids. 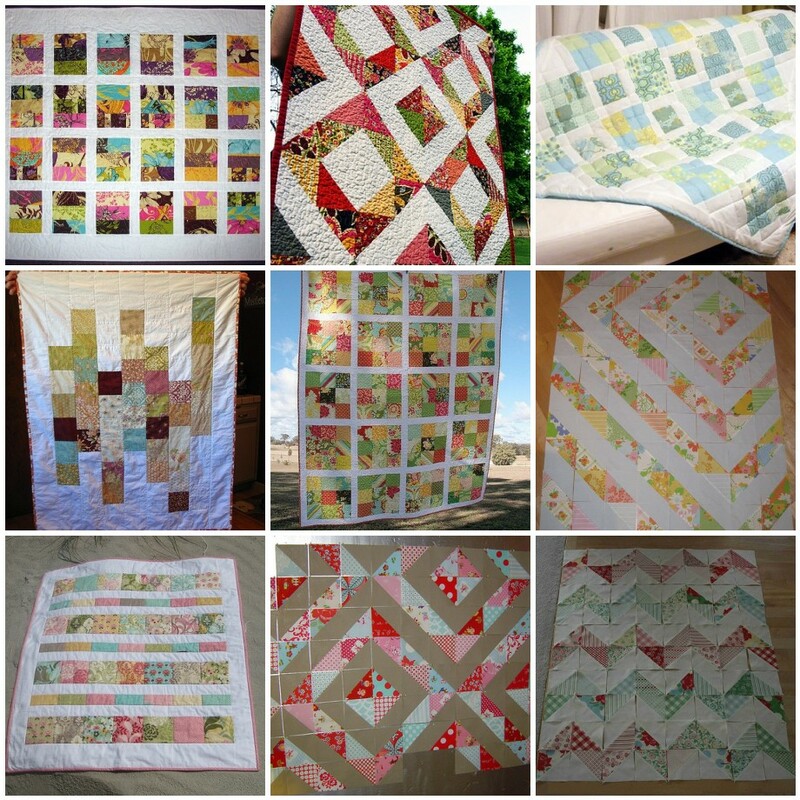 I thought about hand quilting the whole thing with perl cotton (I found a pretty, variegated one in just the right mix of greens and yellows), but it was too much, visually. Instead, I did a few accent rows among the machine cross-hatching.